Hi it's Lindsey here for some DT inspiration. 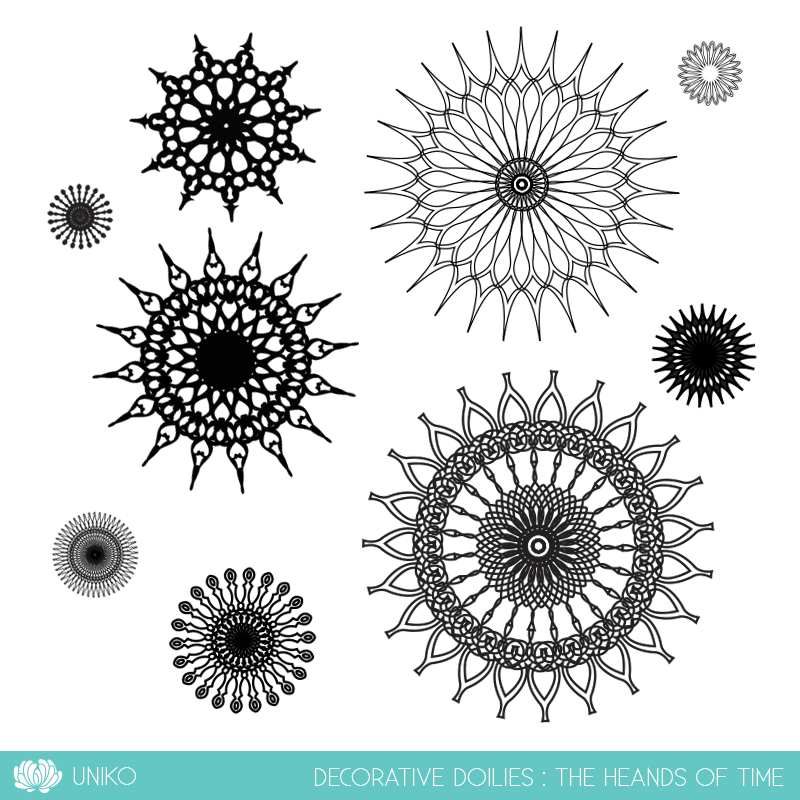 I've been looking back at some of the early Uniko stamp sets and I've dusted off the "Delicate Doilies" stamp set. The set has some wonderfully intricate stamps; it reminds me of the Spirograph toy I had as a child. I've chosen a small, medium and large stamp. 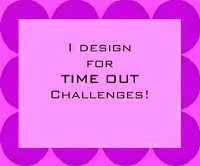 I nearly always choose 3 images in my designs following the "Odd Rule" of composition. Ditto, I've used just 3 sequins. Odd numbers always look better than even numbers as it keeps the eyes moving around the design - if you have even numbers the brain automatically pairs them and then stops looking. With an odd number we feel compelled to look into a picture trying to seek the missing component and find a balance. Honest! Try it and see for yourself. The sentiment is from the new "Birthday Wishes" stamp set from the February release. 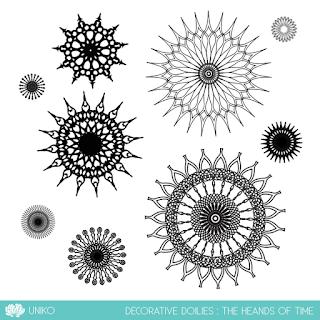 You can find "Decorative Doilies"in the Uniko shop HERE. It's Linda here, with a little DT inspiration for you. I'm using a couple of my Uniko favourites (I have a few!) ..... the beautiful Pure Florals - Peony clear stamp set and the Broken Lines stencil. I think we all love floral images and me personally, the bigger the blooms the better! Now I'm not the best at colouring in my stamped images, I do like to use Distress Inks, I love using my ZIG Markers, and I have dabbled occasionally with watercolours and Copics. Sometimes I get it right, sometimes I don't! So .... if you tend to stay clear of pretty florals just because colouring in is not really your thing, why not leave those beautiful blooms simply black and white. 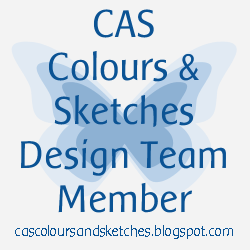 Colour in the easy bits, and add a touch of colour to the background like I've done here. I added a wash of colour to the leaves using ZIG Markers and a waterbrush, and the palest wash of pink to some of the petals, you cn hardly see it's there. I then attached the bloom onto the card, again with foam pads to add some dimension. I love the finished look ..... what do you think? Thanks for popping by ..... enjoy the rest of your day and have a lovely Easter. 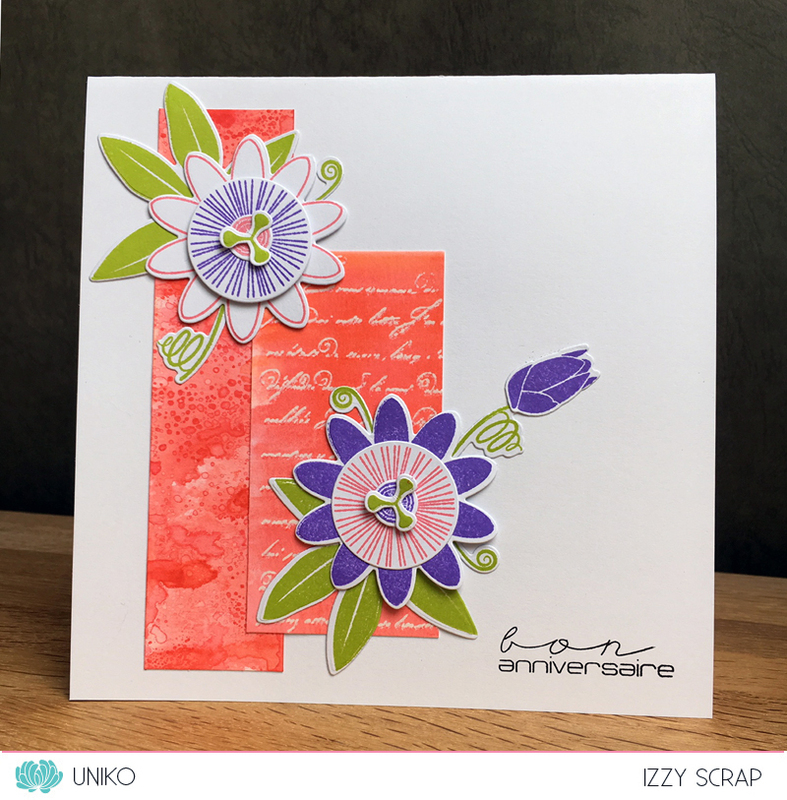 Carol here with a Uniko Studio DT showcase, where I bring out a few of my Uniko Studio products to give them some extra love. 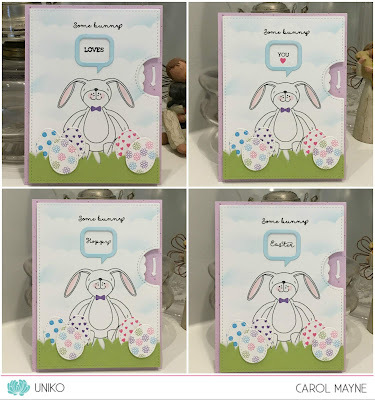 With Easter only days away, I decided to bring out my favourite-est EVER bunny image - Some Bunny - surround him with Easter Eggs decorated with flowers (Some Bunny), polka dots (Background Blocks: Scattered Polka Dots) and hearts (Celebrate with Cake) - then combine them onto an interactive card! So. Much. Fun!! I hope this Some Bunny brings you a smile today! Wishing you a wonderful week and a blessed, happy Easter! Hello Friends Rahmat here. 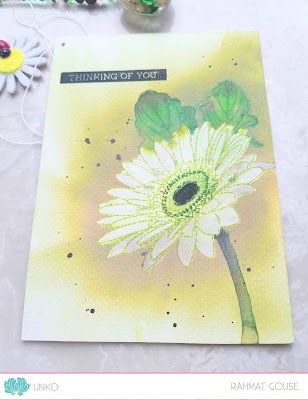 I am up with some inspirations using the Pure Floral Gerbara stamp. I had been experimenting coloring only one flower from this set, using various mediums and techniques. Here is a picture of all the different ones I tried. Today I am sharing 2 of the 3 white flower. For this one I stamped the flower in versafine watermark ink and then masked and did some sponging around it using the hickory DI. 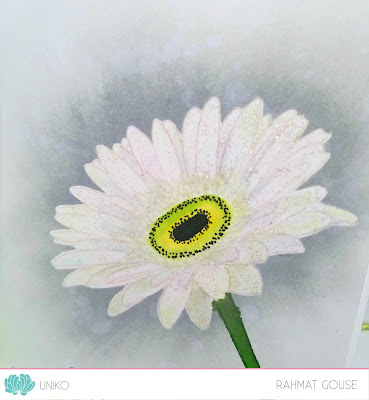 I then did the center with some yellow, green and black markers, and the petals are done with a very light hint of green, pink and grey DIs. I drew a stalk and colored it using markers. I finished the flower with some wink of stella. Anyways after listening to them I decided to work on it a bit more and convert it to a card. 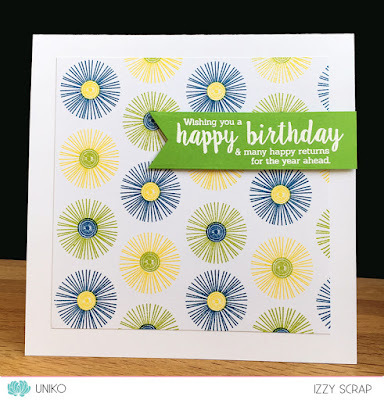 I stamped the flower in twisted citron DI, and finished the center..... and masked and stamped the leaves and inked around with green and brown DI. Watercolored the leaves, and added some splatters. stamped the sentiment to finish off. I hope you like what I have shared, though these are my experiments! Welcome to another Stencil Sunday ..... a relatively new feature on the Blog where we showcase the fabulous Uniko Stencil designs. 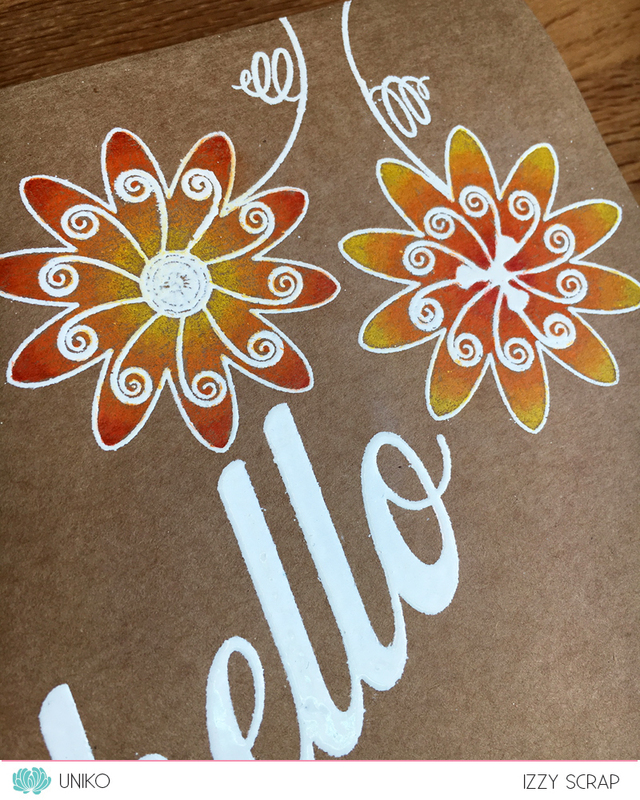 It's Linda here, and I've chosen the beautiful Mehndi Mandala to create some quick and easy cards that you can use for any occasion. Change up the colour combinations for a different look. The inks I've used are all Distress Oxides, I love how they work through stencils, they blend perfectly and give such a nice crisp finish. I inked through the stencil using Worn Lipstick and Picked Raspberry Oxides and then literally cut the mandala in half. I attached the two halves to my card front leaving a small gap across the centre, which I covered using the sentiment banner. I added some pretty scalloped edges to the banner and then attached it using foam pads to add dimension. Use just half of the stencil design ...... I've gone for the top and bottom of my card, but it would also work on each side for a different look. I cut it again twice, from plain white card and layered them together to make it more dimensional, and then attached it across the centre of my card using foam pads and stamped the rest of the sentiment underneath. Diagonals is another great layout ...... one of my favourites in fact. Not sure the sparkle comes across that well on the pictures ...... trust me though it does give a nice delicate detail to the background. Thanks for popping by ..... enjoy the rest of your Sunday. 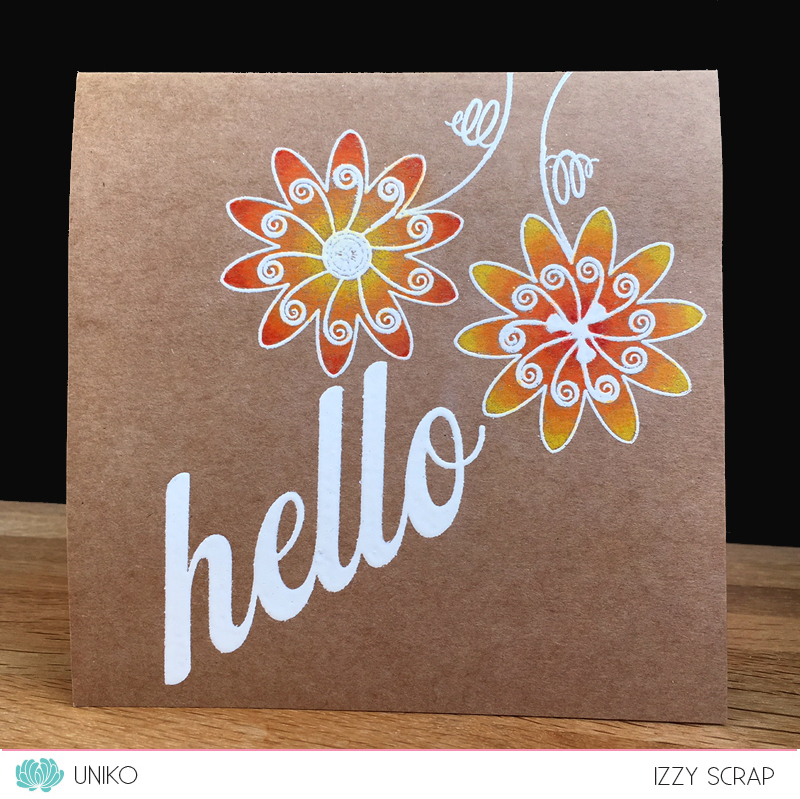 Hello, Wiebke here with a new DT-Inspiration Post. Like always, I used a stencil to create both of my cards. it's heat embossed in white and cut and fold as a simple banner. 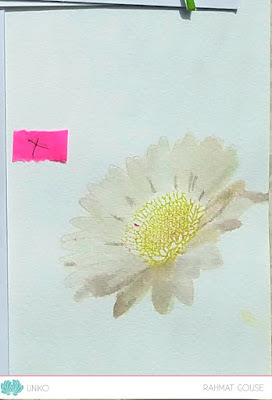 For the first one I just used the red watercolour pencil, traced the petals of my stencil, removed it and then added water to splve the pigments and colour the full petal-area. When the watercolour-part was dry, I re-added the stencil and put red stickles intoto the heart-openings.After removing the stencil I just added the white Novo Drops for some more interest. For the second card I went more colourful and used a rainbow for every flower. I used the same order of colours every time. First I colours all petals in all 4 colours then went over it with my aqua brush in colour-order. after the first step was dry, I added a second layer of pencil-colour, but didn't solve the colours again. I like this kind of kids-crafting-look on this mother's day card. I finished the card with some clear enamel hearts. 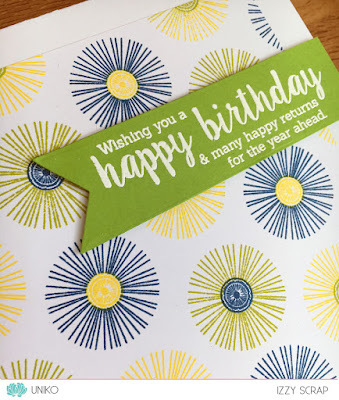 The sentiment banner were adhered on both cards with dimensional foam pads. 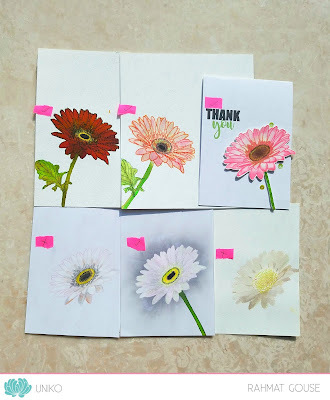 Hope my cards gave you some inspiration for using your stencils in a bit different way. Izzy here. Today I wanted to play with the Passiflora stamp set and matching dies, both part of the last release in February. I wanted to show you the versatility of this stamp set. You will see that with one Uniko stamp set, you can make very different cards : feminine cards, cards for men, or unisex cards. Once the sketch and the colours were found, it was just a game of assembling everything. For this card I used both the stamp set and the matching dies. 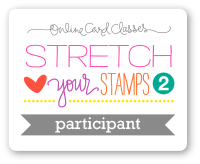 I also used the beautiful Large Background French Script stamp. I made the two background panels with Distress inks using the smooshing technique for the longer one and the ink resist technique for the larger one. I die cut all the different parts of the Passiflora, put them back in my Misti and I stamped the images on top. For this one I only used two of the stamps from the set. I chose a combo of Altenew colours that suit well for a man and I had fun doing this pattern. I also used the Birthday Wishes to make the sentiment strip. I flat adhered the pattern panel on the double card and I foam mounted the white heat embossed sentiment strip on top. 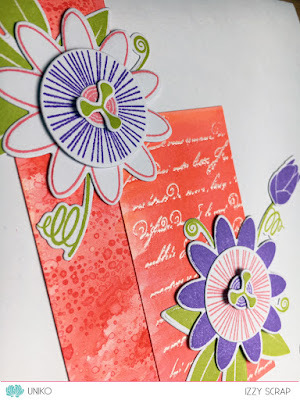 Once again I used different stamps from the set to create these two whimsical flowers. 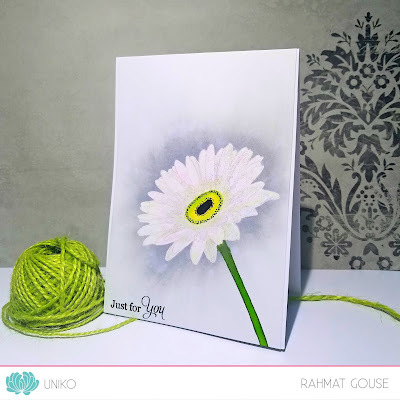 I white heat embossed on a Kraft card to keep it neutral. Then I chose a combo of colours that suit either for women or for man, and I made an ombré with my colour pencils. 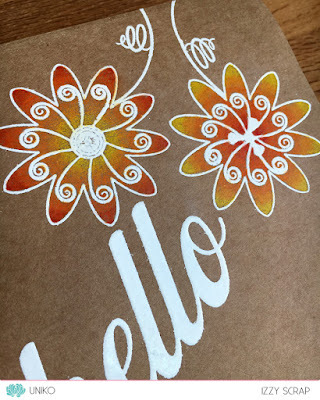 To finish my card and to keep it CAS, I used the Big & Bold - Hello as sentiment. 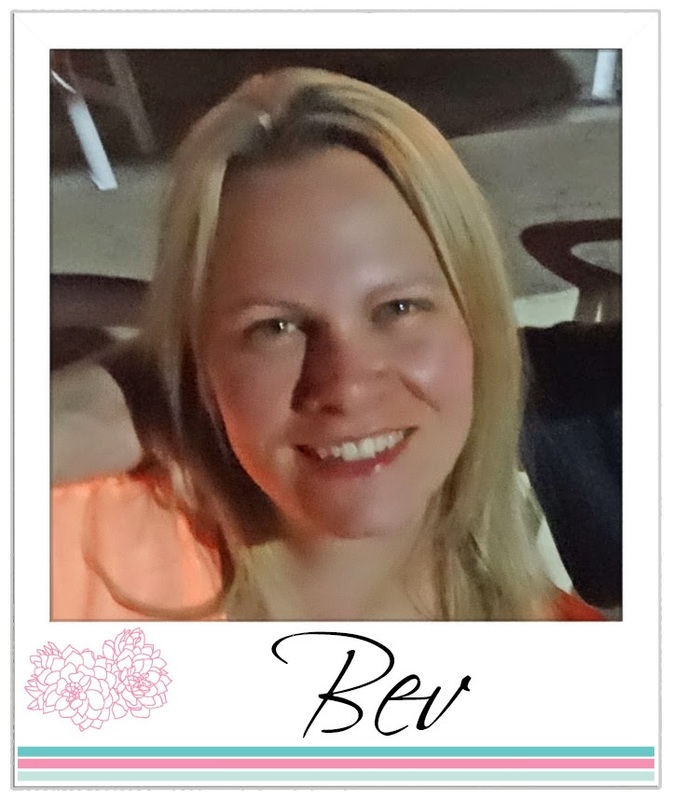 Thanks so much for stopping by on the blog today. 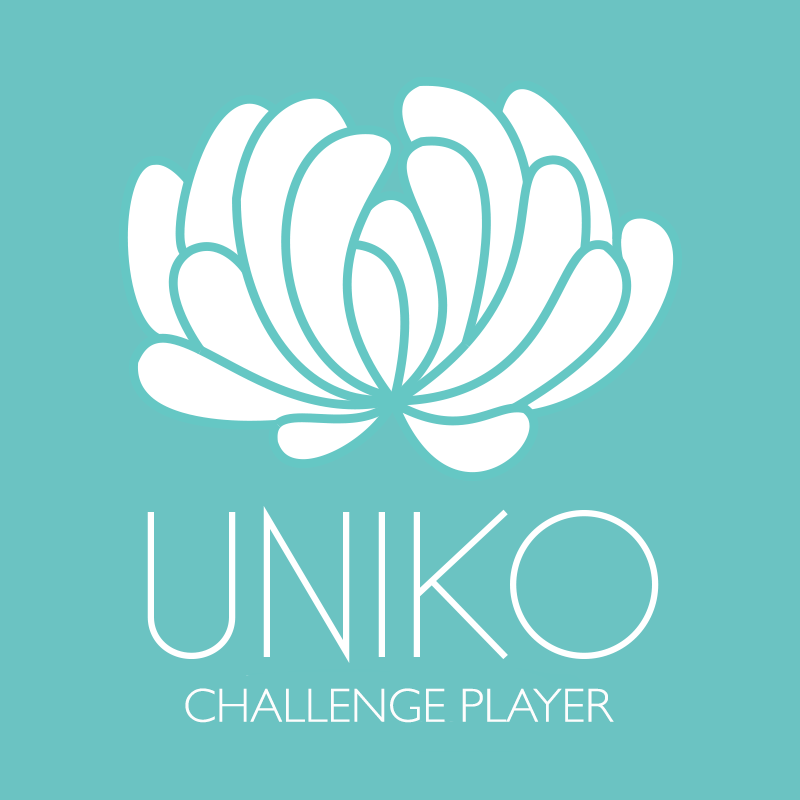 I hope you like my cards and that you will give your Uniko stamps a try ! Have a fun crafty week !